A trio of young ladies from Arizona will play their hand at the national stage. Two weeks ago, Samantha Schadler, Hana Hall, and Abi Archer all finished 1st, 2nd, and 3rd respectively in the Girls Championship race at the NXR-Southwest Regional to qualify for the 11th Annual Running of the Nike Cross Nationals in Portland, Oregon. Sam Schadler is the only returner among the three from the Copper State and will look to improve on her 56th place finish from last year at Glendoveer Golf Course. Meanwhile, Archer and Hall are the two newcomers to the national scene and Hall is only a junior! 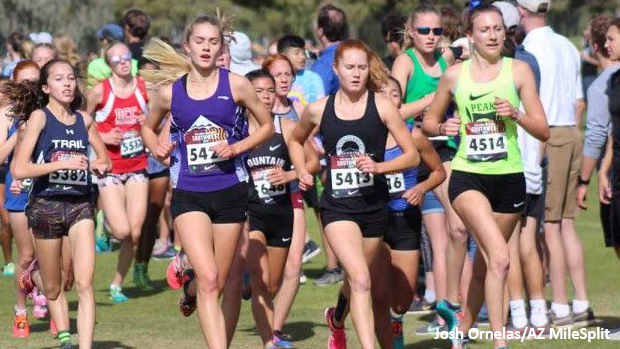 Let's have a deeper look at AZ's three representatives at NXN!